Jack and Jill Nursery School teacher Krista McCrum helps students, from the left, Julius Morelli, Chase Pandolfino, CiCi Elder and Delylah Gearhart, with an activity to prepare them for kindergarten next fall. Educators say giving children opportunities to play and interact with other children will help with socialization ahead of kindergarten. With kindergarten registration approaching, families need to be prepared on what their children need to know before they head to school next fall. Jessica Quinter, principal at Juniata Valley Elementary School, noted that giving children opportunities to play and interact with other children will help with socialization ahead of kindergarten. Making sure children know simple tasks, like learning to zip a coat or washing hands, is important. “It’s also helpful if students can do some self-help tasks, such as zippering a coat or backpack, hand washing, opening items such as a crayon box or snacks, independently,” she said. Other things, like learning letter names, sounds, shape and color recognition, counting and writing a child’s name is also important. Registration for Juniata Valley Elementary School has been scheduled for Monday, April 22, and Tuesday, April 23, at the Juniata Valley Elementary School. Brent Pistner, elementary principal in the Southern Huntingdon County School District, also added some things parents and guardians can help children with when it comes to preparing children for kindergarten. The Southern Huntingdon County School District as well as the Huntingdon Area School District, often hold events like kickoffs to kindergarten so parents and children can get an idea of what their children need to know before the start of kindergarten. For example, there will be a Kickoff to Kindergarten event held from 5:30-6:30 p.m. Thursday, March 21, at Standing Stone Elementary School, where future kindergartners can learn about skills like fine motor skills, learning the alphabet and numbers. Additionally, with immunizations and vaccinations making news, parents need to know what immunizations are required before their students enter school. According to the state Department of Health, four doses of tetanus, diphtheria and acellular pertussis, including one dose given after the 4th birthday, are required as well as four doses of polio, including one dose given on or after fourth birthday and at least six months after previous dose given, two doses of measles, mumps, rubella, three doses of hepatitis B, two doses of the varicella vaccine, otherwise known as the chickenpox, or evidence of immunity needs to be proven. Members of the Juniata College Mock Trial team, front row, from the left, Colin Daly, Rian Fantozzi, Fiona Skinner, Michaela Musselman; back row, Molly Harris, Matt Munoz, assistant coach Rachel Cain, head coach David Andrews, Ellie Miller and Mitch Jellen, will head to Long Island, New York, this weekend to complete against the best teams in the country at the national level. Less than one year following the program’s formation, the Juniata College Mock Trial Team will set out this weekend to take on the best of their peers at the National Championship Series in Long Island, New York. Under the guidance of coach Attorney David Andrews, the team members earned the bid to attend the national competition with their outstanding performance at the American Mock Trial Association Regional Tournament at Penn State University Feb. 7-9. Juniata’s team includes senior Haley Walker of Altoona, freshman Michaela Musselman of Bedford, junior Meadow Walshaw-Wertz of Sunbury, junior Olivia Drake of Hollidaysburg, sophomore Anne Hoover of Curwensville, sophomore Fiona Skinner of Camp Hill, freshman Matthew Munoz of Worthington, Ohio, senior Rian Fantozzi of Glenshaw, junior Colin Daly of Camp Hill and freshman Mitch Jellen of Telford. During the regional tournament, Juniata’s Mock Trial team defeated Columbia University, Cornell University, New York University, Susquehanna University, Bucknell University and Ithaca College. Walshaw-Wertz was awarded an Outstanding Witness Award at the closing ceremonies. As part of the Mock Trial Program, Andrews teaches a course which allows the students to earn academic credits during the semester. Those teams which also earned bids to move on to the National Championship Series at the recent regional tournament were Cornell University, New York University, Columbia University, Penn State University and the University of Scranton. Each team is provided with discovery including deposition transcripts and exhibits to prepare to argue their case. The team will leave for the Suffolk County Courthouse in Long Island, New York, Friday, and will engage in competition throughout the weekend. Sandy Ridge Market assistant manager Marilyn Hocker stocked a display case with fresh-baked donuts this morning in preparation for Fasnacht Day, a Pennsylvania Dutch celebration that falls on Shrove Tuesday, the day before Ash Wednesday, which is tomorrow, Wednesday, March 6. The tradition is to eat the very best foods, which are part of the German tradition, and lots of it, before the Lenten fast. Huntingdon County PRIDE volunteer Darla White checked in donated items at the auction headquarters Tuesday morning. Items will be accepted through Friday, March 8. The weather may point to mid-winter, but the surest sign of spring is in sight as volunteers gear up for the annual Huntingdon County PRIDE Telethon by collecting donated items at the auction headquarters. This year’s headquarters location at 421 Penn St., Huntingdon, will remain open 9 a.m. to 5 p.m. through Friday, March 8. Huntingdon County PRIDE, which stands for Promoting Rehabilitation, Independence, Dignity and Education, holds a very important place in Huntingdon County as it provides vital services for those in need. 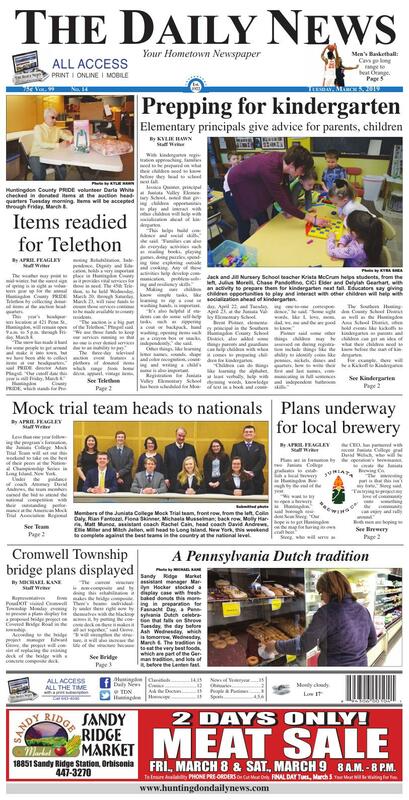 The 45th Telethon, to be held Wednesday, March 20, through Saturday, March 23, will raise funds to ensure those services continue to be made available to county residents. The three-day televised auction event features a plethora of donated items which range from home décor, apparel, vintage items, household products, furniture, gift certificates, services and much, much more. Big ticket specialty items have included vacation getaways, furniture and vehicles in the past. A crew of faithful Huntingdon County PRIDE volunteers are staffing the headquarters daily to accept donated items and catalog them into the database ahead of the auction. The closing day of the Huntingdon County PRIDE headquarters is scheduled to allow enough time for the items to be cataloged and photographed, entered into the computer system and finally, packaged and delivered to the Smithfield Fire Hall. A final list of all auction items will also appear in The Daily News prior to the Telethon. Leading up to the Telethon, many civic groups are working to raise funds and Huntingdon County PRIDE will host its ever-popular annual PRIDE Wing-Off Sunday, March 10, at the Smithfield Fire Hall. For more information on the auction headquarters or the Telethon, call the PRIDE office at 643-5724. Representatives from PennDOT visited Cromwell Township Monday evening to present a plans display for a proposed bridge project on Covered Bridge Road in the township. According to the bridge project manager Edward Grove, the project will consist of replacing the existing deck of the bridge with a concrete composite deck. According to Grove, the proposed concrete deck should add approximately 30 to 50 years of added life to the bridge. The existing bridge was built in 1990 with an asphalt deck. “There was a bridge in Pittsburgh a number of years ago that had a a deck like this bridge fail and became unstable. It became a federal thing to get rid of all of the non-composites and make them composite. It’s kind of been the process for a number of years now,” said Grove. Grove related that a composite bridge consists of concrete beams and a concreter deck that are tied together with rebar for reinforcement. According to project manager Bruce Schweitzer, this particular project is the only Huntingdon County bridge in the 11-bridge project group, with the other 10 falling within Fulton and Bedford counties. “The project gets let Dec. 12 so it will get awarded to a contractor at that point, and it will proceed to the contractor Jan. 28 2020, and that gives them the ability to start submissions and get everything going on their part,” said Schweitzer. According to Schweitzer, the detour will stay on Route 522 and will reroute traffic to covered bridge road via the covered bridge. “This particular project, the detour for this one is going to be mid June to start, to stay outside of the school year because there is a school bus route that goes through there, and it will be done by mid August. It should only be four to six weeks for the project length, so this one will be done outside of the school year,” said Schweitzer. All of the bridges in the grouping will be completed by the end of the summer of 2021, but this particular bridge will be completed early to not interfere with school bus routes. “This one does need to be done outside of the school year, so it does need to be done in June, July and August, so we can spec out what particular bridges need done. So far, there’s only two bridges in the packet of the 11 that need to be done outside of the school year, so we’ll just mandate that this one gets done this year. It’s in no worse shape than any of the other bridges are, it just happens to be when we can schedule it out,” said Schweitzer. Grove clarified that even though the current bridge deck is safe, it does not meet the current standards of condition. “All of these bridges are in poor condition, so this will fix the poor condition and upgrade it to good condition. All of the bridges they rate based on structural adequacy, by doing this fix, it will bring them up to a greater condition of what’s there now,” said Grove. One concern before the public meeting was the access for fire and EMS crews to reach the small group of houses that are affected by the detour. Schweitzer related that those concerns have been set at ease. “EMS was here during the public officials meeting and actually stated the fire trucks can get through the covered bridge at the end of the road, they can’t get an aerial truck through there, but they can work with ground ladders and be able to maintain fire protection and EMS support during the four to six weeks of the project, so it’s not an issue at this point,” said Schweitzer. Citizens or organizations that have questions or historic knowledge of the project area are encouraged to contact Schweitzer at 696-7189 or bschweitze@pa.gov. Plans are in formation by two Juniata College graduates to establish a local brewery in Huntingdon Borough by the end of the year. Steeg, who will serve as the CEO, has partnered with recent Juniata College grad David Welsch, who will be the operation’s brewmaster, to create the Juniata Brewing Co. Both men are hoping to instill their vision and hope for the future into the business venture. The partners have purchased equipment from Gearhouse Brewing Co. in Chambersburg, a company currently undergoing expansion. With the system purchased, Steeg and Welsch hope to produce a variety of beers for customers to sample at a location to be determined soon. The beer will be sold in growlers and crowlers, containers designed to be filled on demand. Steeg said his goal is to be operational by early fall. Much of that plan hinges on securing the necessary funding and completing all of the paperwork involved in establishing a brewery. For more information about Juniata Brewing Co., visit the Facebook page.